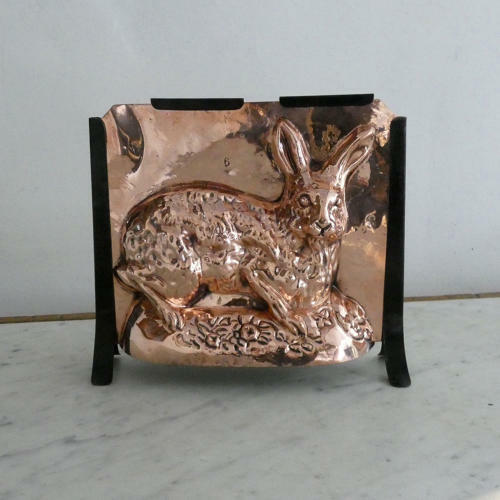 A rare, two part copper mould in the shape of a rabbit. This is quite large for a mould of this type. It is made from quite a heavy gauge of copper and is either French or Swedish in origin. It does not have any manufacturers marks but both sides are marked with a letter 'G' and one is also marked with a number '6'. The mould dates from c.1880 but the black metal stand has been made at a later date in order to display the mould. Originally it would have been held together by metal clips and it would, most probably, have been used for moulding chocolate. It is very well detailed and it is in excellent condition. The tinning, to the interior, is still in very good, bright, usable condition. Some of the detail in the design does not show to its' best in the photos as it is particularly difficult to photograph because of all the small, reflective surfaces. Price includes postage within the U.K. and Western Europe. Shipping to the U.S.A. add £20.